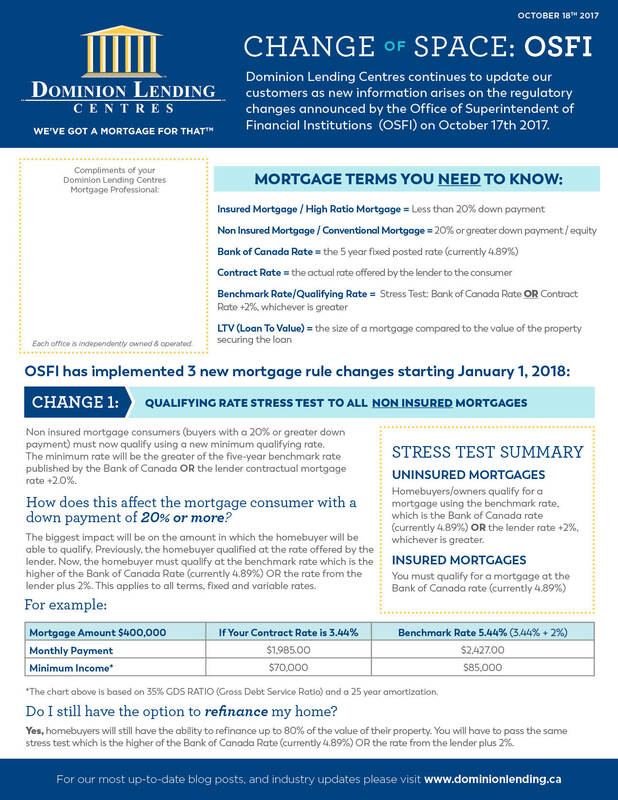 Another set of Canadian mortgage rule changes was announced this week and these changes hurt. A lot! When is our Federal Govt going to realize that national policy aimed at “cooling off” prices in two major markets is hurting far more people / stakeholders than it’s helping? I only need to point to a Canadian mortgage default rate of .30% vs 10-15% in the height of the US meltdown to see that we are not talking about the same scenario in the slightest. Let’s be honest – mortgage rule changes grab headlines and headlines become the ultimate back-pat for our elected “leaders”. 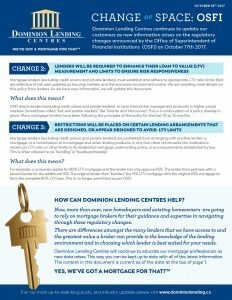 I posted the the following blog in January 2017 when the first wave of policy changes were implemented http://bit.ly/StopTheMortgageMadness. And the hits just keep on coming. In what logic should a person with a 30-50% equity position or more and strong fundamentals be held to rigid lending standards in the name of “risk”? In what logic should a company whose business is to lend money not be allowed to decide on their own the risk they are willing to bear when lending their money for return/profit of their business? These changes do not just affect buyers. They affect all mortgage holders. They also affect a bunch of mortgage lenders that play a VERY important role in the mortgage marketplace in Canada. There are mortgage specific (monoline) lenders that once were focussed on offering lower rates and mortgage costs while improving service levels, payment privileges, accessibility and all around lending experience for the consumer. 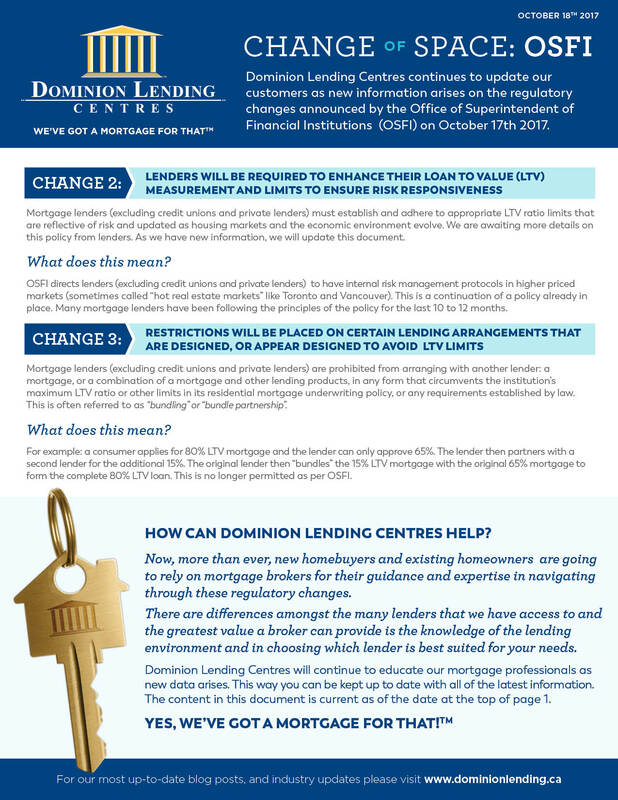 These lenders are being bullied out of the competitive space by these government rule changes. Their competitive advantage and cost of funds is being increased dramatically by these changes and this is a direct benefit to balance sheet lending institutions IE chartered banks. Banks have no problem charging a higher rate of interest if there aren’t competitors that are able to keep rates down. They also have no problem recapturing market-share they once lost to monolines through the mortgage broker channel. The cost of mortgage financing has & will continue to rise directly due to these changes by our Federal Govt. I thought Govt is elected to act on behalf of citizens? Sure seems like they are acting more on behalf of a handful of financial institutions better know as “The Big 5”. Maybe that’s always been the case? 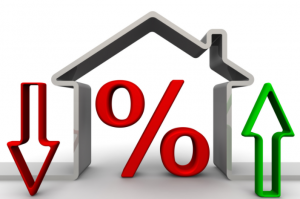 You may have heard rumblings of mortgage rate increases recently. As a mortgage broker, I can always tell when media have published their frequent “Lock in your Rate or Doom” headlines. We have received quite a few calls and emails over the past week or so from clients concerned that their mortgage rate / payment could be on the rise. It’s actually no wonder there’s so much concern. One flip to Financial Post this evening and I was ready to liquidate all of my personal belongings and head for my panic room. Luckily I know how media sells papers (there are still things called newspapers for sale right?) / clicks and it’s not by publishing “Nothing to Worry About Today” headlines. I did feel however that there’s been enough concern raised by our variable rate clients that I wanted to get in touch and ease some concerns. Before doing something rash such as switching your current (likely awesome) variable rate mortgage into a more stable (boring /more expensive) fixed option, it’s important to remember why we opted for variable on your mortgage in the first place. It wasn’t just a short term solution to capture rates lower than fixed at the time. It was to set-up the mortgage that should improve your net worth position over the LONG TERM. There was much more strategy that just grabbing variable because it was half a point or more lower than fixed when we set up your mortgage. Most of the rumblings that you are hearing right now about rates going up are due to increased bond rates which affect fixed mortgages not variable, which are attached to prime. In fact, we’ve already seen most fixed mortgage rates increase in the past week anywhere from .10-.25%. Prime rate hasn’t moved. That means your variable mortgage looks even better in comparison to fixed right now. I’ll say that again — the rate increases that we’re seeing right now are increases to FIXED mortgages. Since fixed rates don’t change over the life of the mortgage, the only folks directly exposed to these changes are those who are currently in need of a mortgage right away and who haven’t been told or convinced of the virtues of variable over fixed anyways (IE they need a better mortgage person in their lives). Now I will say this — there has been some speculation that we could see the Bank of Canada increase the prime rate for the first time in over four years in the next few months. This is much earlier than most economists predicted at the start of the year but the rumblings certainly appear to becoming more pronounced. So realistically, I don’t want to rule out an increase to Prime & subsequently variable mortgages & Home Equity & personal Lines of Credit by the end of the year. This is much more likely to happen than we were led to believe 3-4 months ago. Remember though, even if Prime was to increase, your variable mortgage would still be substantially lower than the current rates of fixed and it’s extremely unlikely that an increase will be more than .25% at any one time. An increase to the prime rate (if/when this happens) would probably change your payment $20-$35 a month (a .25% increase to prime will raise your payment approx $12 per $100,000 of mortgage). Locking into a new fixed-rate at the current market prices would increase $50 plus (you’d be taking a rate of 2.94 or higher by locking in in most cases. So it’s not as though a change in the prime rate is going to affect your budget considerably and certainly not more than flipping into fixed. 1) You have to choose a mortgage term equal to the time you have left or longer. 2) You would be locking into current fixed rates not the one that was available when you agreed to on your existing mortgage. That means you effectively pay a higher interest rate presently as a stable payment insurance policy where the added premiums go into your lender’s pockets. Why wouldn’t you just take that extra money that you’d be paying and pay down extra principle on your mortgage to rapidly decrease the overall mortgage balance. Then when/if rates do go up, your mortgage balance is reduced so the increase isn’t as noticeable. That’s effectively what you are doing with the variable mortgage. Heck we could even increase your payments to exactly what they’d be if you were to flip into a fixed and pay down even more principle in the mean time. Long story short I struggle to see many situations that would see our variable clients benefit by flipping into a fixed mortgage in anticipation of dreaded mortgage doom that we’ve been hearing about for seemingly the past decade. I now have a saying that I borrowed from a colleague — “life is variable — your mortgage should be too”. In conclusion: I’m not worried about a slight shuffle of variable rates whenever they do come and I’m on variable with my personal mortgage as well. We knew there could be adjustments to the rate when we set up the mortgage in the first place. It wasn’t meant to abandon ship at the very first rate change ripple. The ONLY clients I ever recommend being on a fixed mortgage are those with very narrow budgets where any payment change could cause distress or when they simply do not qualify under variable underwriting. 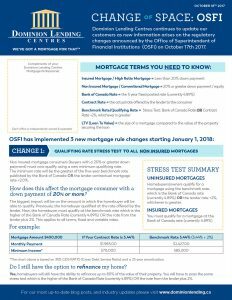 In case you missed news of this on Tuesday, CMHC announced that buying a home with less than 20% downpayment gets more expensive as of Mar 17 due to increased mortgage default insurance premiums. Now having worked as a Mortgage Professional for almost 10 years, I’m used to government & lender policy changes, credit qualification tightening and a seemingly endless number of restrictions being added to mortgage approval processes, making even the best credit candidates left to feel like they seen as untrustworthy or unable to buy a home / borrow money they know they can afford. Up until this point, what do we do? As mortgage professionals we shrug our shoulders, gripe internally to colleagues, rip pages out of our lending policy manuals, replace them with the seventh edition of revised notes and get to updating our clients and realtors most immediately affected by the new wave of changes. That was up until this point. Up until the 2nd MAJOR government policy change announcement directly effecting mortgage borrowing in less than 3 months! At this stage I had to scream the question (through social media channels) on behalf of mortgage consumers – when is enough, truly enough? What we are failing to point out is that as of March 17 (Happy St Patrick’s Day!! ), consumer’s equity IE Net Worth is further eroded when purchasing a home with less than 20% down for the 3rd time in 4 years! The article points towards profitability. I’m sorry but aren’t the default insurers in place to MINIMIZE RISK to lenders not MAXIMIZE PROFITABILITY. Mortgage defaults in Canada are less than .50%. They were 10.0% in the US during the credit crisis and are still well over 10 times as high in the US as of 2015. Here’s a novel concept when it comes to collecting premiums – make qualifying for a home a bit easier. Reduce the barriers to entry to buying a home in Canada (In US you actually get a tax advantage by owning a personal residence) and then collect your pound of flesh by having more loans under administration. Price increase doesn’t have to be the only solution to increasing revenues / assets under administration. DO A BETTER JOB, HELP MORE PEOPLE, DO MORE BUSINESS! I can 100% GUARANTEE that if one of the private default insurers were able to say, “you know what, we feel the premiums we are charging are fair, we aren’t going to follow CMHC’s lead on this move”, the resulting influx of business flooding here vs CMHC would trump this so called prudent “Negligible” premium increase. More laughable is that these changes charge a higher premium (respectively) to those putting MORE than 5% down? How on earth can you say that you are mitigating risk by charging a higher respective premium on a LESS RISKY loan? Mind-blowing!! At the end of the day, when you mix less equity to start with high penalty fixed mortgage products, a historical desire to change mortgages every 3.7 years by consumers and relatively flat housing market (at least where I’m at in Alberta), buying a home sure doesn’t represent the long term sound financial strategy that it once did. If only we didn’t need a place to live. With all of the recent regulation changes, OSFI audits & threats of sanctions or further regulation, and forthcoming costs of lender risk-sharing, one can pretty easily start to see that our ivory tower occupants sure seem hell bent on choking out whatever semblance of a dream of homeownership remains for a considerable portion of our consumers. Must be a lot of landlords in Sr Govt positions! This post doesn’t even touch on the drastic industry ramifiations and stemming from the rule changes announced in October 2016. In fact, most non-mortgage professionals would have zero knowledge of the true power shift in favor of Big Banks (away from customer) as a result of the changes as the true meaning & impact of these was seemingly disguised behind a relatively minor qualification rule change. We have already seen mortgage interest rates rising and lending options narrowed across the board as a direct result of the October changes. When competition is narrowed in any industry, the largest players (in our case, the Big Banks) have much more contol over prices (interest rates). Very soon we will likely be fielding questions to the effect of “But I am putting MORE money down, what do you mean my interest rate is higher than the person putting 5% down?” *Topic for another conversation. **This post was initially published in an internal mortgage broker discussion forum bearing the same name. I left the line in the public article to convey the passion and care for that so many of my industry colleagues share. We are licensed professionals who do what we do with the upmost priority being placed on saving people money & helping them achieve financial goals. The ability to do so has again been hampered by unnecessary government intervention.